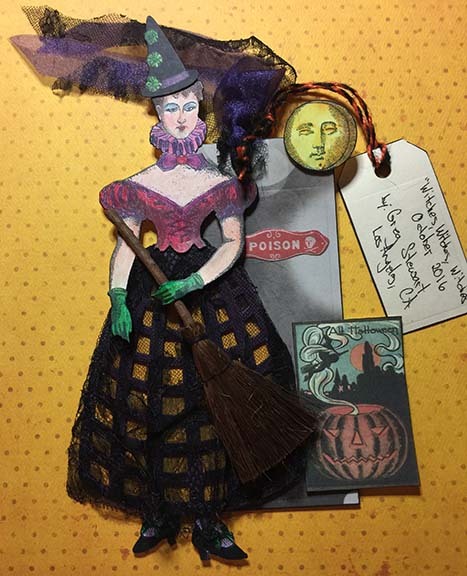 “Witches, Witches, Witches”, Halloween 2016 Tag Swap, using Character Construction stamp plates: Theatre of Dreams #1, French Laundry #6 & Mad Tea Party #2. Dress was trimmed with black lace and silk trims. I belong to this tag swap group that is obsessed with Catherine Moore’s Character Construction rubber stamps. Each year she creates a series of stamps, ranging from 6 – 24 sets that can have from 1 – 8 images per set. There is a theme each year. Some examples are: Circus, Timekeeper’s Garden, Paris, Beekeeper’s Tea, Bird & Bee Paperie, etc. Each month our group decides on a theme that typically relates to the holiday for the month (if there is going to be one). We create 5 tags, keeping one for ourself and sending the other four to Cathy, our group coordinator. She in turn sends us back four tags from different people from all parts of the US, Canada and Europe. So much fun! For Halloween the theme was “Witches, Witches, Witches” and you can imagine the end result. Close-up detail of face and coloring with Derwent Inktense watercolor pencils. 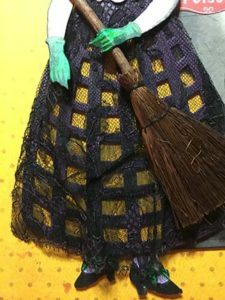 Close-up detail of witch with broom and lace dress overlay. 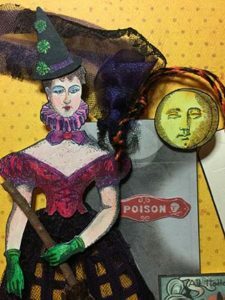 Previous PostLucy’s Disappearing 4 Patch QuiltNext PostHaunted Wishes!